Plantar view showing the relationships between the metatarsal heads, the intermetatarsal ligament, and the neuroma. Neuroma and adherent fibrofatty tissue. Morton's neuroma is a common disease entity of the foot. 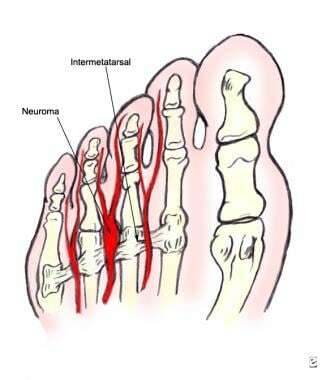 The incidence of Morton's neuroma is presumed to be the same internationally as in United States. The female-to-male ratio for Morton's neuroma is 5:1. The highest prevalence of Morton's neuroma is found in patients aged 15-50 years, but the condition may occur in any ambulatory patient. Morton TG. Peculiar painful affection of fourth metatarsophalangeal articulation. Am J Med Sci. 1876. 71:37. Munir U, Morgan S. Morton Neuroma. 2018 Jan. [Medline]. [Full Text]. Valero J, Gallart J, Gonzalez D, Deus J, Lahoz M. Multiple interdigital neuromas: a retrospective study of 279 feet with 462 neuromas. J Foot Ankle Surg. 2015 May-Jun. 54 (3):320-2. [Medline]. Kim JY, Choi JH, Park J, et al. An anatomical study of Morton's interdigital neuroma: the relationship between the occurring site and the deep transverse metatarsal ligament (DTML). Foot Ankle Int. 2007 Sep. 28(9):1007-10. [Medline]. Pastides P, El-Sallakh S, Charalambides C. Morton's neuroma: A clinical versus radiological diagnosis. Foot Ankle Surg. 2012 Mar. 18(1):22-4. [Medline]. Mahadevan D, Venkatesan M, Bhatt R, Bhatia M. Diagnostic Accuracy of Clinical Tests for Morton's Neuroma Compared With Ultrasonography. J Foot Ankle Surg. 2015 Jul-Aug. 54 (4):549-53. [Medline]. O'Connor FG, Wilder RP, Nirschl R. Foot Injuries in the Runner. In:Textbook of Running Medicine. New York: McGraw-Hill; 2001. 258-260. Xu Z, Duan X, Yu X, Wang H, Dong X, Xiang Z. The accuracy of ultrasonography and magnetic resonance imaging for the diagnosis of Morton's neuroma: a systematic review. Clin Radiol. 2015 Apr. 70 (4):351-8. [Medline]. Ata AM, Onat SS, Ozcakar L. Ultrasound-Guided Diagnosis and Treatment of Morton's Neuroma. Pain Physician. 2016 Feb. 19 (2):E355-8. [Medline]. [Full Text]. Bignotti B, Signori A, Sormani MP, Molfetta L, Martinoli C, Tagliafico A. Ultrasound versus magnetic resonance imaging for Morton neuroma: systematic review and meta-analysis. Eur Radiol. 2015 Aug. 25 (8):2254-62. [Medline]. Zanetti M, Weishaupt D. MR imaging of the forefoot: Morton neuroma and differential diagnoses. Semin Musculoskelet Radiol. 2005 Sep. 9(3):175-86. Claassen L, Bock K, Ettinger M, Waizy H, Stukenborg-Colsman C, Plaass C. Role of MRI in detection of Morton's neuroma. Foot Ankle Int. 2014 Oct. 35 (10):1002-5. [Medline]. Akermark C, Saartok T, Zuber Z. A prospective 2-year follow-up study of plantar incisions in the treatment of primary intermetatarsal neuromas (Morton's neuroma). Foot Ankle Surg. 2008. 14(2):67-73. [Medline]. Monacelli G, Cascioli I, Prezzemolo G, Spagnoli A, Irace S. [Surgical treatment of Morton's neuroma: our experience and literature review]. Clin Ter. 2008 May-Jun. 159(3):165-7. [Medline]. Valente M, Crucil M, Alecci V. Operative treatment of interdigital Morton's neuroma. Chir Organi Mov. 2008 May. 92(1):39-43. [Medline]. Lee KT, Lee YK, Young KW, et al. Results of operative treatment of double Morton's neuroma in the same foot. J Orthop Sci. 2009 Sep. 14(5):574-8. [Medline]. Bucknall V, Rutherford D, MacDonald D, Shalaby H, McKinley J, Breusch SJ. 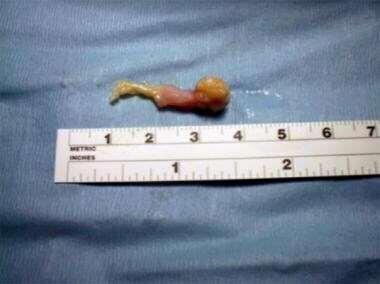 Outcomes following excision of Morton's interdigital neuroma: a prospective study. Bone Joint J. 2016 Oct. 98-B (10):1376-81. [Medline]. Valisena S, Petri GJ, Ferrero A. Treatment of Morton's neuroma: a systematic review. Foot Ankle Surg. 2017 Apr 5. [Medline]. Villas C, Florez B, Alfonso M. Neurectomy versus neurolysis for Morton's neuroma. Foot Ankle Int. 2008 Jun. 29(6):578-80. [Medline]. Title CI, Schon LC. Morton neuroma: primary and secondary neurectomy. J Am Acad Orthop Surg. 2008 Sep. 16(9):550-7. [Medline]. Pace A, Scammell B, Dhar S. The outcome of Morton's neurectomy in the treatment of metatarsalgia. Int Orthop. 2010 Apr. 34(4):511-5. [Medline]. Faraj AA, Hosur A. The outcome after using two different approaches for excision of Morton's neuroma. Chin Med J (Engl). 2010 Aug. 123(16):2195-8. [Medline]. Kundert HP, Plaass C, Stukenborg-Colsman C, Waizy H. Excision of Morton's Neuroma Using a Longitudinal Plantar Approach: A Midterm Follow-up Study. Foot Ankle Spec. 2015 Aug 7. [Medline]. Habashy A, Sumarriva G, Treuting RJ. Neurectomy Outcomes in Patients With Morton Neuroma: Comparison of Plantar vs Dorsal Approaches. Ochsner J. 2016 Winter. 16 (4):471-4. [Medline]. [Full Text]. Killen MC, Karpe P, Limaye R. Plantar approach for Morton's neuroma: an effective technique for primary excision. Foot (Edinb). 2015 Dec. 25 (4):232-4. [Medline]. Reichert P, Zimmer K, Witkowski J, Wnukiewicz W, Kulinski S, Gosk J. Long-Term Results of Neurectomy Through a Dorsal Approach in the Treatment of Morton's Neuroma. Adv Clin Exp Med. 2016 Mar-Apr. 25 (2):295-302. [Medline]. Lee J, Kim J, Lee M, Chu I, Lee S, Gwak H. Morton's Neuroma (Interdigital Neuralgia) Treated with Metatarsal Sliding Osteotomy. Indian J Orthop. 2017 Nov-Dec. 51 (6):692-6. [Medline]. [Full Text]. Morgan P, Monaghan W, Richards S. A systematic review of ultrasound-guided and non-ultrasound-guided therapeutic injections to treat Morton's neuroma. J Am Podiatr Med Assoc. 2014 Jul. 104 (4):337-48. [Medline]. Mahadevan D, Attwal M, Bhatt R, Bhatia M. Corticosteroid injection for Morton's neuroma with or without ultrasound guidance: a randomised controlled trial. Bone Joint J. 2016 Apr. 98-B (4):498-503. [Medline]. Rout R, Tedd H, Lloyd R, et al. Morton's neuroma: diagnostic accuracy, effect on treatment time and costs of direct referral to ultrasound by primary care physicians. Qual Prim Care. 2009. 17(4):277-82. [Medline]. Yap LP, McNally E. Patient's assessment of discomfort during ultrasound-guided injection of Morton's neuroma: selecting the optimal approach. J Clin Ultrasound. 2012 May 15. [Medline]. Markovic M, Crichton K, Read JW, et al. Effectiveness of ultrasound-guided corticosteroid injection in the treatment of Morton's neuroma. Foot Ankle Int. 2008 May. 29(5):483-7. [Medline]. Lizano-Diez X, Gines-Cespedosa A, Alentorn-Geli E, et al. Corticosteroid Injection for the Treatment of Morton's Neuroma: A Prospective, Double-Blinded, Randomized, Placebo-Controlled Trial. Foot Ankle Int. 2017 Sep. 38 (9):944-51. [Medline]. Fridman R, Cain JD, Weil L Jr. Extracorporeal shockwave therapy for interdigital neuroma: a randomized, placebo-controlled, double-blind trial. J Am Podiatr Med Assoc. 2009 May-Jun. 99(3):191-3. [Medline]. Moore JL, Rosen R, Cohen J, Rosen B. Radiofrequency thermoneurolysis for the treatment of Morton's neuroma. J Foot Ankle Surg. 2012 Jan-Feb. 51(1):20-2. [Medline]. Mahadevan D, Salmasi M, Whybra N, Nanda A, Gaba S, Mangwani J. What factors predict the need for further intervention following corticosteroid injection of Morton's neuroma?. Foot Ankle Surg. 2016 Mar. 22 (1):9-11. [Medline].